The volunteers and one paid helper have made tremendous progress clearing, trimming, pruning, and hauling debris from Dhammadharini's 1 1/3 acre yard. There is a need for ongoing maintenance and gradual improvements to keep this space lovely for outdoor meditation. Contact Dhammadharini you can offer an afternoon, a day, or a weekend for outside work. If you would like to organize a service day with your friends or group, we can put it on our calendar. There is useful work to do at all levels of strength and skill. Some good weekend days for yard-work (weather permitting) are March 31, April 7, April 21 & April 28. We would like to be spruced up for our Vesak Celebration on March 29! January 15th until February 26th 2018. During this time our residents will be cutting out our usual outside activities and internal projects and be focusing on meditation and Dhamma teachings at the Monastery in Penngrove. We will have no alms rounds during this time. We will all be maintaining silence as much as possible. Day visitors welcome to come for meditation and/or to offer a meal. Come for all or part of a day. You may arrange to offer prepared fresh meal in person by contacting the monastery. Groceries or frozen dishes to be offered later are also extremely helpful. From 12-1, daily you may pick a chore and help with cleaning the monastery. Your support makes the work light and gladdens the whole community. January 13th: Nourishing the Enlightenment Factors. Weather permitting, volunteers are welcome to help cut the grass and tidy up outside areas at Dhammadharini Monastery. Come when you can between 9 am and 5 pm on Saturday April 1. If you can bring your own string trimmer (weed wacker) or mower, the work will go much more quickly. This weekend is a good opportunity to meet and speak with Dhammadharini's visiting bhikkhuni, Ayya Dhira who will be departing at the end of the Spring Retreat, and to meet our newest resident, Nekkhamma Siaw. These two will be leading the day, while the other Dhammadharini residents are engaged with meetings and teachings in North Carolina, Massachusetts, Los Angeles and Sri Lanka. 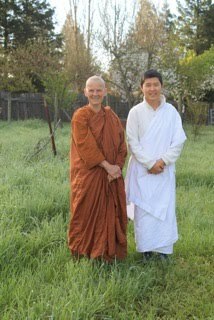 From April 10 to May 19, our monastic community will be on retreat, with some retreatants at Aranya Bodhi hermitage, and some at the Dhammadharini Monastery in Penngrove. Both locations will depend on the support of volunteers to help provide a secluded time of practice for the Sangha. See the document below for current volunteer openings, and email us at dhammadharini.monastery@gmail.com if you would be able to fill any of the listed positions. We hope that some volunteers will also be able to join us for practice when they come -- either to the monastery, which will be open to the public for silent meditation throughout the retreat; or to the hermitage, which will be otherwise closed to the public, but will be open to volunteers on the day of their scheduled tasks. In this way, we hope that the retreat can be of benefit to the wider community. From March 25-29 residents will be at Aranya Bodhi hermitage making final preparations for the upcoming Spring Retreat. An important project is clearing fallen trees to make our kutis accessible, as well as final cleaning of all the spaces. There will be minor construction jobs, wood cutting, and other needed tasks. Welcome to bring a meal. Please consider an enjoyable volunteer day or two in the forest, that includes digging and Dhamma. John R, a qualified contractor, will lead a 10 day work period at the monastery and Aranya Bodhi in late July, early August. If there’s a good group of helpers, we will . Please consider joining for all or part of this community effort in Dhamma and drywall.